On Thursday, 9 December, I helped lead an Infoforum in Emory’s Woodruff Library. Infoforums are events that we have on almost a weekly basis, where the entire library staff is invited to hear one or more people present on current projects, recent conferences, or their work. The range of subjects is impressive, and the format is admirably loose enough to let people ask questions as the presentation is ongoing. In other words, it encourages participation. My remarks were not scripted, but I wanted to publish the slides that I used and comment on them in an approximation of what I discussed. To make things simpler to follow along, I’m associating my comments with the number of the slide. Just click and read. Gamification is the process of adding game elements to get people engaged in an activity. Some people will do almost anything for a badge or recognition. I’m one of those people. We can see gamification at play in applications such as Foursquare (Slide 2) or Gowalla (Slide 3), both of which keep track of where you have checked in and provide badges or pins, respectively, that are based on where you’ve been and how often you’ve been there. My gym also uses gamification with the Fitlinxx (Slide 4) system, which tracks my workouts and tallies the points that I earn from lifting weights and doing cardio. There are occasional prizes you can get as you advance through the levels. After working out for six years, I’ve earned a bag tag, a towel, and a t-shirt. But it’s the points and the metrics that are important to me and were what got me working out on a regular basis. Finally, there are apps such as EpicWin (Slide 5) that seek to apply gamification to your to-do list. As you complete items that you need to do, you get experience points and level up. Gamification can be applied to academia as well. The SOCL Project (Slide 6) is one example. Old Dominion University professor Richard N. Landers ran a trial this summer where he created a separate social network for more than 600 psychology students. The key feature of the site, as far as I’m concerned, was the certification system in which students could earn badges (Slide 7) for completing voluntary quizzes. Landers reports that 28% of students took these quizzes, which is an extraordinary number when you consider that they get no credit for the quizzes—just a little electronic badge. Students who achieved a particular level of certification were then able to serve in the site’s mentoring program, helping other students learn while reinforcing their own learning. (See an article about the SOCL Project at ProfHacker for their usual, insightful coverage. The Goizueta Business Library (Slide 8) at Emory has actually been doing some gamification in giving out certificates to students who complete four courses on library skills. They Business Librarians report that the students love getting their piece of paper, which is the carrot they need to take the courses and to pick up library skills along the way. What’s more, they get to add a line to their resumes about being certified by the library. This should sound familiar to all of us since adding lines to our CVs is sometimes what everything we do in academia seems to boil down to. That’s not to make light of the work that we do when adding these CV lines, but…yeah. You know what I mean. But we don’t just have to use game principles to get people to do something. We can also have games that specifically teach you how to use the library (Slide 9). One great example of this is the University of Florida’s Smathers Libraries’ game Bioactive (Slide 10). Bioactive puts you in the role of a lab assistant who is looking for the information related to a stolen virus and trying to prevent a biological attack on the campus. The game is playable on the web and uses images that have been mapped with HTML to reveal clues (Slide 11). Solving the puzzle involves using library resources, including course reserves, study guides, databases, the library maps, and the library catalog. As you can see in Slide 12, some of the mapped images actually are of the library itself. Playing the game, then, not only teaches you to use the library’s resources electronically, but it also teaches you what these spaces in the physical library itself look like.Bioactive may be described as an ARG—an alternate reality game (Slide 13). My shorthand for describing ARGs is that they are scavenger hunts with a healthy dose of conspiracy theory thrown in as narrative. The Wikipedia has a good definition as well. For “Games as Research,” I talked about the fact that games are increasingly becoming an object of research and not just of recreation. For a library, this means that we need to provide scholars with the resources they need for their work. I pointed to the Lyons New Media Centre at the University of McMaster as an example of a library that provides gaming equipment—specifically a Playstation 3, Xbox 360, and Wii (Slide 19). Students can use these tools for recreation, but they are also there for scholars to do their work.Our neighbors at Georgia Tech provide good examples of serious work that is being done on gaming (Slide 20).I also mentioned how I had the chance to review grants for the NEH’s Office of Digital Humanities on December 1 (Slide 21). Without going into specifics about particular proposals that I read, I was able to share that at least a fifth of the grants that I had reviewed had been for games and game-like projects. While the academy as a whole might not yet be certain as to how to use games in teaching and research, there certainly is increasing interest in the prospect at the moment.Somewhat perversely (as a symptom of being rushed as I was finishing my slides), I mentioned www.gamesinlibraries.org (Slide 22) at this moment as a resource for learning more about games as research. The link probably better belongs under the concept of “Library Games,” it’s a site worth exploring one way or another. I began the discussion of libraries as interactive spaces with a slide from the presentation that Chris Bourg gave when visiting our library from Stanford (Slide 24). She mentioned that librarians are no longer in the role of gatekeepers. Libraries seldom have closed stacks and given the advent of electronic catalogs, it’s not particularly difficult to find the materials people are looking for. This reflects my own view of the library. Students probably use more and more library sources than ever since they are so easy to get at, but they no longer need to come to the library itself. As such, I tend to think students and faculty view the library more as a space for getting work done than anything else. As such, we can rethink what it means to work in a library and how libraries work. One thing that I would like to do is to make the library a more interactive space. Games are one way that we can accomplish this.Again, McMaster’s Lyons New Media Centre is working toward this with the inclusion of recreational gaming devices (Slide 25).At Emory this week, we’ve been experimenting with creating a sense of interactivity in the library with our Secret Study Breaks (Slide 26-27). I’ll be writing more about this event shortly, so I’ll leave it at that. Along with creating a more interactive space for library users, we can also work to create a more interactive space for those who work here. As I’ve written elsewhere, it’s been an interesting transition moving from working as a relatively independent scholar and teacher to a member of several different teams within a large organization. Although I’ve been working in Emory’s main library for six months now, I still don’t know everyone’s names because we don’t always come together. Games represent an opportunity to have some sort of interaction between people who wouldn’t ordinarily associate with one another. What’s more, games give these people something to talk about besides work in the library.Our library has made efforts at such cross-team building. In August of this year, we had a drum circle. While not a game in a normal sense, I think we could call it a game where the winners are those who do not look foolish. The ladies in Slide 29 are winning. Scott Turnbull’s team in the library has had lunches devoted to playing games (Slide 30), which led to better intra-team cooperation and understanding of each other’s work. I would like to see our library think about occasional game-playing activities as ways to allow librarians to connect with each other. We didn’t merely discuss games, we tried to play a sort of game with the audience. The room we normally use for these presentations can be arranged as one would like. Based on one of the DLI members suggestions, we arranged the seats in concentric circles with an aisle running through the middle. When the librarians entered the room, we asked them to take sides around the circle based on whether they identified themselves as skeptics about what games could do or if they saw themselves as pro-gaming. Our intention was to allow people to move around the room as they felt themselves convinced by our argument. And if it lead to enhanced discussions, then all the better. 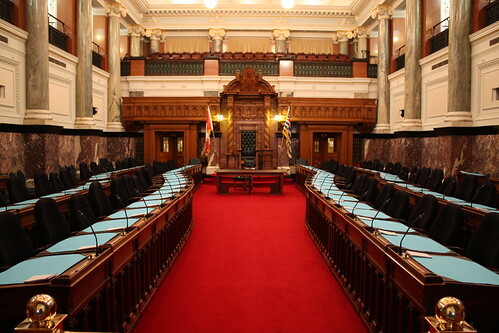 After all, it seems to work for members of Parliament in Britain, British Columbia (pictured), and elsewhere. The presenter stood in the middle and had the opportunity to constantly move as he or she tried to address everyone in the round. We were also being video recorded from two angles simultaneously. (I’m definitely looking forward to seeing the bullet time that will assuredly result from Miriam Posner‘s mad skillz in the editing room.) The discussion was indeed lively, ranging from questions about gender bias and historical oversimplification within games to comparisons of academic work to gaming. The most interesting question–from my perspective–came from someone who admitted to being a collections person at heart: she wanted to know how libraries can tell what resources libraries needed to be acquiring if we want to enable research 50 years down the road. To this question, I suggested that we do not need to be especially focused on particular games so much as on the hardware and software to run the games. Since Emory is already receiving attention for its work on the born-digital materials in the Salman Rushdie archive, I suggested that we might think about strengthening our ability to work with such materials by acquiring pieces of hardware for our special collections. In this way, we would be following the lead of the Maryland Institute for Technology in the Humanities (MITH), which has a fabulous collection of vintage computers. We could work to build a collection similar to MITH’s while also looking to the present, archiving not just game consoles but also computers as they are retired from library service. We already have the beginning of a collection here that we have already paid for, in other words. This entry was posted on December 10, 2010, 4:52 pm and is filed under Research, Technology. You can follow any responses to this entry through RSS 2.0. Both comments and pings are currently closed.